Are you looking for a specific knitting cast on? Here is an alphabetical, linked list of all the cast ons I’ve already covered with notes of their features. It is in no way complete and I will add to it over time. The one you are looking for is not on this list? Drop me a line, I’ll see if I can help you out and I’ll add it to this list in the future. Close up of the Alternating Long Tail Cast On. Provisional cast on using Judy’s Magic Cast On. If you are looking for reference books: I can recommend the book Cast On, Bind Off: 54 Step-by-Step Methods; Find the perfect start and finish for every knitting project (*) by Leslie Ann Bestor. Many of these cast ons are included in that book as well with detailed instructions. And I’ve been wanting to buy Cast On, Bind Off: 211 Ways to Begin and End Your Knitting (*) by Cap Sease for a while. It also seems like a good comprehensive reference book. 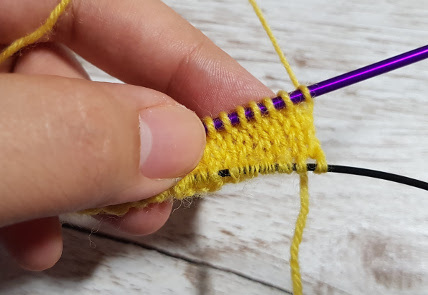 On top of that Craftsy has a class on the subject of cast ons and bind offs that is well worth watching: 40 Ways to Cast On & Bind Off with Aurora Sisneros (*).